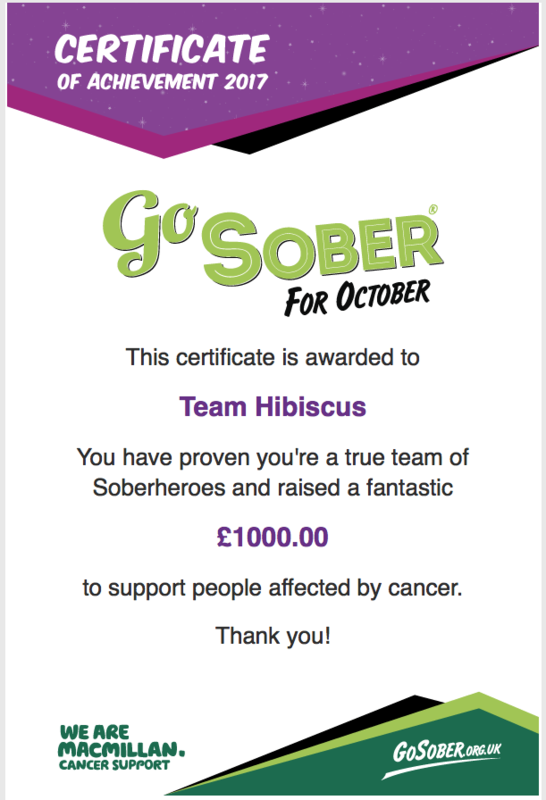 Team Hibiscus are officially Soberheroes! Sober for October 2017, is finally over and we made it to the very end without so much as a sniff. There were 78,100 participants who took part in the Macmillan Cancer Support fund raiser and the grand total was an amazing £4,049,374! As a result of your generosity, Team Hibiscus managed to raise £1,000 and we’d like to thank everyone who donated to our efforts and supported the cause. The Macmillan charity are a constant source of support, giving people facing cancer the energy and inspiration to help take back control of their life and make life with cancer about living. Well done, Brian and Jamie; it’s time to celebrate – soda and lime?